The Monkey King Is a Superhero! Sun Wukong, or the Monkey King, is a household name in Asia. Even a 3-year-old knows the story of this supernormal monkey being imprisoned under a mountain by the Buddha. Likewise, how he is later given a divine mission to accompany a Buddhist monk on a journey to retrieve Buddhist sutras from India. Journey to the West, written in 1592 during the Ming Dynasty, is one of the four famous classical novels of China. It has received hundreds of film adaptations, cartoons, dramas, animated features, and comics. The novel has far-reaching influence even in modern society because the story is not only entertaining, but it is also philosophical. There are many thought-provoking teachings and principles on the nature of the human condition and the role of suffering and endurance during the path of enlightenment. Performer Huang Jingzhou plays the role of Sun Wukong in the Journey to the West performance portion of Shen Yun Performing Arts. He revealed a small secret that among the props on Shen Yun’s stage, his favorite is the Monkey King’s golden staff. We interviewed Huang Jingzhou to get his feelings about playing Sun Wukong. How do you feel about playing the role of Sun Wukong? Huang: I like his fearlessness toward Heaven and Earth. While on stage, I feel like I can “pull the mountains” and beat the demons as I fight them. Do you think there is any defect in Sun Wukong’s character? Huang: I admire the fearlessness and self-confidence of the Monkey King, but in many cases, he is arrogant and causes trouble. But don’t worry because his story has a good ending. What is your favorite supernormal power of Sun Wukong’s? Huang: In one somersault he can travel very far! The Monkey King’s most powerful ability is to travel 108,000 li (38,880 miles) in one somersault. Any others that you admire? Huang: Yes, his ability to be able to split his body and produce clones of himself. We can depict any of his powers on stage, over the course of Shen Yun’s many years. However, the most practical one to show on stage is his “72 Earthly Transformations,” which he uses to trick demons by shapeshifting into someone else. What is your opinion of playing the role of the Monkey King on Shen Yun’s Stage before and after the performance? Huang: When I was a child, I thought that Sun Wukong was the role model for the superheroes in traditional Chinese culture. In the beginning, he didn’t have any respect for the gods. He thought he was invincible and created havoc in Heaven, which caused him to be punished by the Buddha by imprisoning him under a mountain. This turned the Monkey King into a humble believer, and taught him to not put his ego first. After 500 years of penance, the Buddha assigned him a mission to protect the monk Tang Sanzang on his journey to the West to retrieve Buddhist sutras. Because of this, the Monkey King also contributed to the introduction and promotion of Buddhism into China. And of course, in the end, he attains enlightenment along with the others, so he achieved positive results for himself and the rest of the world. What kind of inspiration can you obtain from playing the role of Sun Wukong? Huang: Actually, all of us are on the journey to obtain the Sutra. It’s only that we are going to obtain different kinds of Sutra. Everyone has different goals, but all for the sake of struggle for our own lives. 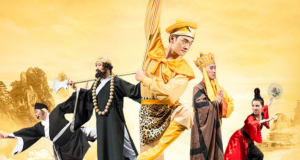 Members of Shen Yun are actually similar to Sun Wukong. We do this not for the sake of fame, fortune, and emotions, but for the sake of faith, to bring the beauty of traditional culture to the world, just like the Monkey King does in protecting Tang Sanzang and the propagation of Buddhism. Although we don’t have the “72 Earthly Transformations” of Sun Wukong as powers, we have to insist on going through our 81 hardships all the same. When we come to the end, we will achieve victory. Just like the Monkey King, as long as you fight to the end, it is a victory! In conclusion, in the eyes of Huang Jingzhou, Sun Wukong is strong, confident, and successful. Shen Yun’s 2019 scheduled performances are here. Please try to attend and don’t miss Huang Jingzhou’s performance as the Monkey King!